VANCOUVER, British Columbia, Oct. 18, 2018 (GLOBE NEWSWIRE) -- Chakana Copper Corp. (TSX-V: PERU; OTC: CHKKF; FWB: 1ZX) (the “Company” or “Chakana”), is pleased to announce it has completed infill drilling on the upper 450m mineralized extent of Breccia Pipe 1 (Bx 1) at the Soledad copper-gold-silver project in central Peru. All drilling to date has been on the portion of the Soledad Project optioned from Condor Resources Inc. Results of the previous fifty-eight drill holes have been released and are also available at www.chakanacopper.com. Two of the holes reported here were designed to explore the western extent of the Main zone, one was designed to penetrate the southern limit of the Main zone, and one (SDH18-078) was drilled outside and parallel to the breccia pipe to serve as a platform hole for a down-hole electromagnetic (EM) survey intended to more accurately identify drill targets extending beyond 450m depth (Figs. 1 and 2). Section looking east showing the Main and blind North breccia bodies at Bx 1 highlighting holes in this release. Light red 3D shapes based on Leapfrog model of breccia from all holes drilled by Chakana. Drill holes show tourmaline breccia (red), andesitic wall rock (green), and other host rocks (other colors). Section includes data from 50m in front of and behind section. 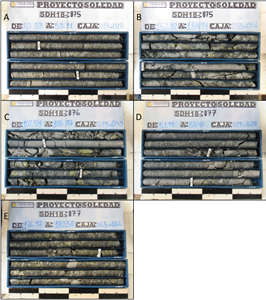 Mineralized intercepts from drill holes reported in this release showing different styles of mineralization in Bx 1: A) SDH18-075 – high-grade shingle breccia from the Main Zone; the interval 47-53m assays 8.54 g/t Au, 1.97% Cu, and 15.3 g/t Ag; B) SDH18-075 – mosaic breccia from the Main Zone; the interval 152-158m assays 0.54 g/t Au, 2.39% Cu, and 119.2 g/t Ag; C) SDH18-076 – mosaic breccia from the Main Zone; the interval 103-108.5m assays 0.98 g/t Au, 4.87% Cu, and 100.4 g/t Ag; D) SDH18-077 – chaotic shingle breccia from the Main Zone; the interval 52-57m assays 8.81 g/t Au, 2.71% Cu, and 186.6 g/t Ag; E) SDH18-077 – mosaic breccia from the Main Zone; the interval 177-182m assays 2.35 g/t Au, 4.33% Cu, and 95.1 g/t Ag. The two holes that test the western limit of the Main zone intersected thick intervals of mineralized breccia. Drill hole SDH18-075 intercepted 102m with 0.75% Cu, 3.77 g/t Au and 55.9 g/t Ag (3.69% Cu_EQ; 5.65 g/t Au_EQ) and hole SDH18-077 intersected 244m with 0.91% Cu, 1.41 g/t Au and 55.6 g/t Ag (2.31% Cu_EQ; 3.53 g/t Au_EQ) before each hole exited the breccia pipe. “The results of these latest holes have identified mineralization consistent with the previous results released for Bx 1 and demonstrate the high-grade nature of the mineralized breccia pipe,” states David Kelley, President and CEO. Examples of mineralized breccias from holes in this release are shown in Figure 3. “We are excited about the project advancement thus far and impatiently await approval of the EIA-SD permit that will allow several additional high priority targets to be tested upon receipt. Our team is ready to submit the modification that will provide access to the expanded mineral rights where several additional outcropping mineralized breccia pipes occur. In the meantime, we continue to drill with a single rig and are expanding our detailed surface mapping and rock and soil sampling across the broader 3,085 hectare land position that we have established. A second rig is on the property at no cost to the Company and can be deployed rapidly when access to the Huancarama and Paloma pipes is granted. 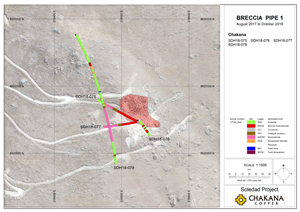 There are 15 known breccia pipes on the combined property with an additional 15 high priority targets that may be blind breccia pipes. We also have a pending down-hole and surface EM survey throughout the expanded area of known breccia pipes that will help us further define and prioritize drill targets. The Company believes that this approach is fiscally prudent and ensures that the drilling is focused on prioritized, well-defined targets,” added Mr. Kelley.